I grew up eating lots of ground meat. We were a big family and there were lots of mouths to feed. Recipes using ground meat were a good, economical dinner solution for my mom on most week nights. My mom is a wonderful cook and baker, but we were not strangers to quick dinners back in the day. We ate lots of hamburgers, noodle casseroles, goulash, meatloaf, and what she called "hamburger steaks". 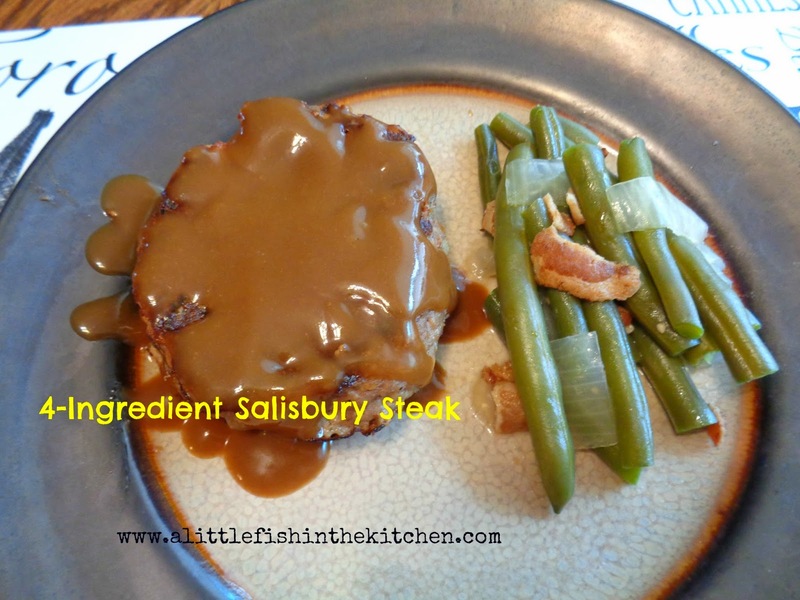 Now I know that what we were actually eating was a mild-mannered version of Salisbury steak, and it's still one of my favorite comfort food dishes of all time. So is meatloaf, but that's a story for another post! When I worked full-time outside of the home, I rolled with what I knew and I also used lots of ground meat recipes to feed my son who was a very, very finicky toddler at the time. He really didn't have much of an appetite for meat, at all, and he would have lived on oatmeal if I let him! But, I was undaunted. His stubbornness didn't stop me from regularly introducing new foods for him to throw off of his plate! This recipe is one I came up with using just what I had in the pantry one night. And believe me, I was genuinely shocked when it was a hit with my little boy. From that moment on, it was served on a weekly basis just because I knew he would eat it! This recipe is also easy on the pocket book and you can safely describe it with three words that should be applicable to recipes, but probably not your prom date: quick, cheap and easy! This one has it all! But, just as a side note, even with all it's simplicity, I love this recipe. When I threw this dish together years ago, I was a strapped, single mom. I was honestly struggling for time and money with very little assistance. I was overwhelmed in every way possible and the moments when it was absolutely clear that I did something right were few and far between. But, every time I serve this super, simple meal and watch my family gobble it up, I relive a teeny-tiny victory from a very hectic era in my life. 1. Mix the ground meat with egg, soup mix and pepper. 3. At a medium heat setting, heat your skillet. Once heated, spray with cooking spray and place patties into the hot pan. Depending on how thick you make them, cook for about 5-6 minutes on each side or until nicely browned. 4. Remove cooked patties from heat and drain on paper towels, if necessary. 5. Serve with gravy, if desired and the side dishes of your choice. Enjoy!